To remain competitive in an increasingly pressurised climate, foodservice operators will need to be at the top of their game. Looking ahead to 2017 and beyond, we’ve summarised some of the key trends from industry experts to help stay ahead of the pack. 2016 was a turbulent year for the foodservice sector to say the least. In the aftermath of Brexit and election of Donald Trump, consumer confidence is expected to stutter this year. Growth is also likely to slow as investment decisions are put on hold as negotiations with the EU commence. Alongside this uncertain macroeconomic environment, caterers are facing rapidly increasing costs as the new National Living Wage comes into effect in April. Thereafter over 25’s will be paid £7.20 an hour, an increase of 50 pence compared to previous rates. Further, food prices are also predicted to rise by 3%-4% in the UK as the impact of a weakened pound sets in. According to Whole Foods, Flexitarianism (eating predominantly vegetables but not strictly vegetarian), is going to be one of the dominant food trends of 2017. Whilst the concept of eating less meat isn’t exactly new (Meat Free Monday was started in 2009 by the McCartneys for example), the signs are that Flexitariansim will begin to become more mainstream in 2017. Looking out to the high street, last year we saw Pret launch its first ever vegetarian only pop-up ‘Veggie Pret’. The company reported the trial a huge success turning the pop-up into a permanent site. Pret are now planning a number of new openings in 2017 signalling strong demand from consumers for vegetarian and vegan products. Meanwhile in Silicon Valley investors are pouring money into startups like Beyond Meat are developing plant based alternatives to proteins. Their flagship product, a burger patty which looks, tastes and bleeds like real meat, out sold real meat burgers in a head to head test at Whole Foods last year. Late last year The Caterer reported that takeaway sales increase by more than 50% with rise of delivery companies, accounting for up to 25% of some customers’ spend. There has been some significant movement in the UK with the arrival of Uber Eats, the acquisition of Hungry House by JustEat for £200m, and Deliveroo raising an additional $275m in funding to compete. Consumer behaviour is fundamentally changing to the point where we might actually question whether we need the physical restaurant. Deliveroo for example are launching ‘RooBoxes’ where customers can pick up their food, and high profile chefs like David Chang are intentionally designing menus that travel well. On the production side, flexible kitchen spaces and central production units which can be scaled up or down depending on demand are reducing barriers to entry for smaller operators. ShareDining for example are creating an airbnb style marketplace for kitchen spaces and caterers. Caterers will need to respond by offering more choice of offer, new methods of ordering and delivery, flexibility and better communications to keep up with technology startups who continue to disrupt the space. In 2016 food waste as an issue really exploded. 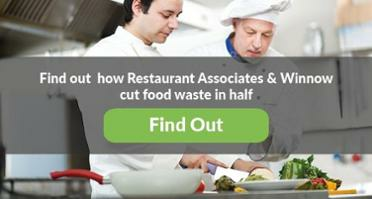 High profile campaigns run by Hugh Fearnley-Whittingstall and The Evening Standard highlighted the problem, and brands like AccorHotels responded by setting ambitious targets to reduce food waste. In 2016 pioneers like celebrated chef and food waste activist Massimo Bottura hit the headlines by turning leftovers from the Olympic village in Rio into three course dinners for people living in the city’s favelas. It is clear that consumers care about the issue of food waste and this trend will continue in 2017 becoming more mainstream. More chefs are using beet greens, chard, turnip greens, mustard greens, carrot tops, many items often previously discarded. Restaurants are making a conscious effort to turn product previously considered waste into something more interesting and inventive. Think picking watermelon or spiralizing vegetable stalks. With food costs rising costs, increased competition and increasingly demanding customers, it’s becoming abundantly clear is that caterers of all shapes and sizes would benefit from an increased focus on food waste to maintain margins. Do you work in contract catering? We’re interested to hear what you think 2017 will hold. Let us know in the comment section below.